Quantity must be entered in increments of 7. 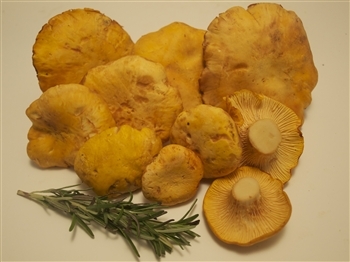 The golden chanterelle mushroom is a culinary delicacy that has a wonderful earthy, or fruity aroma that is reminiscent of apricots, and is usually bright yellow to orange in color. They have gill-like ridges that stem from the edge of the cap to about halfway down their stipe. Chefs from around the world love their versatility and rich, peppery flavor. Golden chanterelles are great mushrooms to saute in butter, oil, or cream. California chanterelles are the largest in the world, and are extremely meaty. They are usually in season and found along the coast from November to February.